It seems like only yesterday — and yet it also seems so long ago. Only yesterday I was a little girl in Clearwater, Florida, playing in the surf or skating at the new Sunblades rink, dreaming of becoming a competitive ice dancer. And a long time ago, in my mind if not in years, I was 17th in line of succession to the Presidency of the United States, the person entrusted with the safety of every American citizen except the naturalized ones. Maybe it’s because Clearwater days were so wonderful and magical to me. I was the blondest girl in Clearwater — maybe in the whole Tampa Bay St. Pete metro area. And there were a lot of blondes — bottle blondes, sun blondes, and a few natural blondes. But none was as blindingly blonde as I. “Que blanco,” the Mexican girls used to say when they saw me, and try to touch my hair. I’ve always been proud of my Scandinavian heritage, and at such moments I quite literally beamed with pride. When I got interested in politics and began to rise, I thought that all my dreams were coming true at once — because navigating the Republican Party as a woman was kind of like skating; there were patches and slicks you had to avoid or you’d take a hard fall. The ladies know what I’m talking about! But once you reached top speed and began to spin, the world was your ice dance partner. 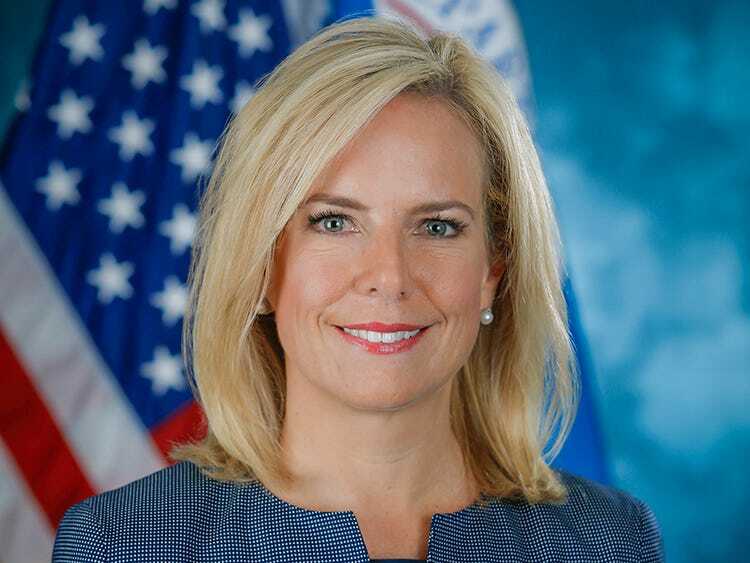 My hard work in the Bush Administration paid off in the Trump Administration, where I was admired not only for my leadership abilities but also for being, as the folks in the President’s inner circle liked to say, “our kind of people.” Steve Bannon and Stephen Miller called me their Nordic Princess and “Kristjen, She-Wolf of Homeland Security,” and gave me many white-gold charms such as the fascinating broken sun cross Miller gifted me on April 20th, which he said was a European holiday. Sitting here now in my office at the Kennedy School of Government, I contemplate my strange journey from Florida to Washington, and our unfinished work defending the homeland from the foreign invader, and I think: If only those people who yelled at me at the Mexican restaurant could see me now, at Harvard, at the very heart of liberal academe! Maybe they would start to understand that we get so much farther as a nation when both sides cooperate. But some people never learn, and those are the people (along with Mexicans, Hondurans, et alia) we have to remove if America is ever going to everything it should be. You can bet your broken sun cross on that!